Today there's a new local site on the block - Povo Boston. They're taking a Wikipedia approach to all things Boston, aiming to bottle the authentic, insider knowledge you know when you live here. They need us to make it happen. So will we show up? Given my love of maps, they pinged me about their cool heat map feature. 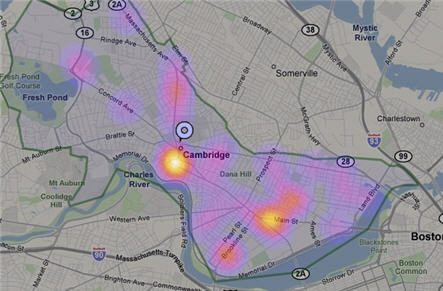 So here you go, a heat map of all the pizza in Cambridge (so far) listed on Povo. Head over to Povo and add your favorite pizza joint or bar or parking spot...what goes around comes around and some day you might benefit from the collective knowledge. Speaking of maps, here's a favorite of mine. I grew up in Rochester, NY, where we call it pop. Now I've been in Massachusetts so long I've crossed over and call it soda. Take a look at this fascinating map (click to see it up close). Look at all the soda transplants in the Midwestern university towns. And what's with the south calling it Coke? What do you call it? Take the poll on the side bar. The site where I originally got this map is not active anymore, but here's a link to a blogger that wrote about some interesting soda/pop research. I just love maps. Really. And as you know, I'm also quite obsessed with sustainability and the ongoing issue with bags. So when Eric Denison sent me a link to this map and story from the New York Times, my antennae began twitching away. 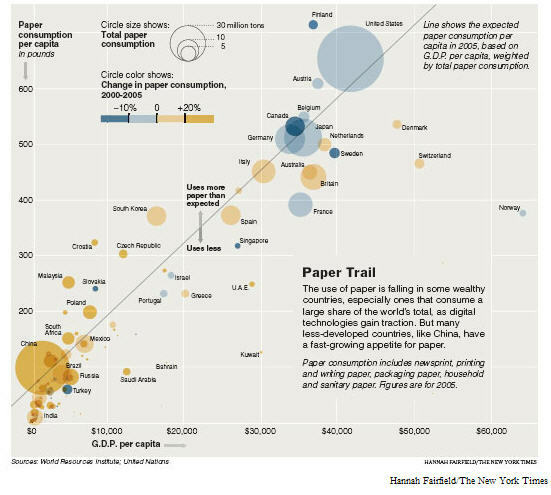 The map shows world wide paper consumption based on country per capita GDP. Take a look at the US - the world's most egregious consumer. On the positive side, we are on the decline for paper use. China? 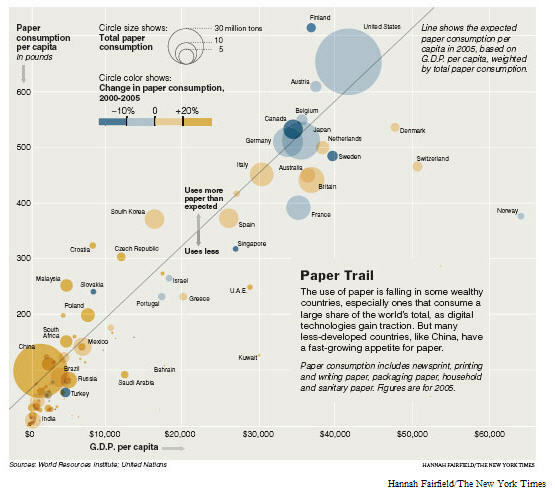 Paper usage is fast on the rise. Eric writes, "Personally, I find visualizations like this fascinating and think they help put a variety of complicated issues in perspective." Right on. With the mountains of data we're generating every day and our innately human visual acuity, mapping is more important than ever. How else will we unlock and communicate the critical information that dwells in the 1s and 0s? The New York Time covers the fact that more and more American households are going paperless, "perhaps more for efficiency than for environmentalism." We all love the convenience of online bill-paying, tickets and gift buying. The truth is, for most things today, the digital copy is the record copy. But paperlessness is most striking to me in my work. I write and create media for a living. But there is almost no paper involved. That's especially so, now that my column doesn't run in the dead tree version of the Globe. How about you? Are you trending toward paperlessness? Thanks for the map, Eric!